The Global Volcanism Program has no activity reports for Griggs. The Global Volcanism Program has no Weekly Reports available for Griggs. The Global Volcanism Program has no Bulletin Reports available for Griggs. The summit of Mount Griggs towers above Knife Creek on the NE side of the Valley of Ten Thousand Smokes. The volcano is uniquely offset west of the NE-trending alignment of volcanoes in the Katmai area. The broad, 2317-m-high stratovolcano, formerly known as Knife Peak, consists of a late-Pleistocene volcano with glacial valleys on the north that was truncated on its SW side by an early Holocene edifice collapse. A Holocene volcano was subsequently constructed within the 1.5-km-wide scarp left by the emplacement of a large SW-flank debris avalanche. Nested cones with three concentric craters mostly fill the scarp, and thick, blocky lava flows blanket the SW flanks of the volcano below the collapse scarp. In contrast to the more silicic centers of the Katmai area along the crest of the range, lava flows from Griggs are dominantly andesitic in composition, and dacitic lava flows are uncommon. No historical eruptions have occurred from Griggs, but noisy fumarolic jets near the summit can be heard from the valley floor, 1750 m below. Hildreth W, 1987. New perspectives on the eruption of 1912 in the Valley of Ten Tousand Smokes, Katmai National Park, Alaska. Bull Volcanol, 49: 680-693. Hildreth W, Fierstein J, Lanphere M A, Siems D F, 2002. Mount Griggs: a compositionally distinctive Quaternary stratovolcano behind the main volcanic line in Katmai National Park. In: Wilson R H, Galloway J P (eds), Geologic Studies in Alaska by the U. S. Geological Survey, 2000 U S Geol Surv Prof Pap, 1662: 87-112. There is no Deformation History data available for Griggs. There is no Emissions History data available for Griggs. 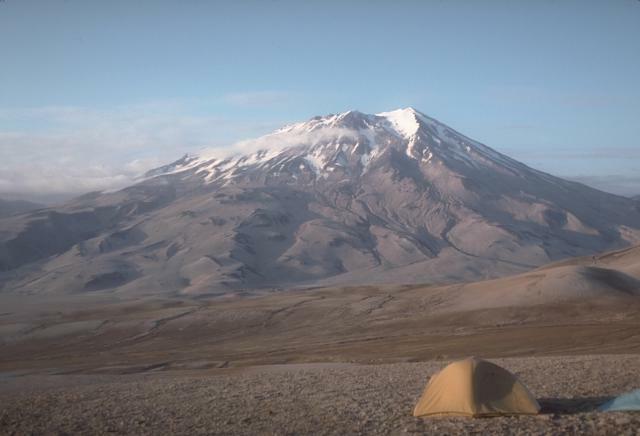 Griggs volcano, 2265-m-high, is the highest of a group of volcanoes in the Katmai area. It lies 10 km behind the volcanic arc defined by other Katmai group volcanoes. Griggs is only slightly dissected and is largely of Holocene age. Although no historical eruptions have been reported from Griggs, vigorously active fumarolic fields persist in a summit crater and along the upper SW flank. The slopes of Griggs are heavily mantled by fallout from the 1912 Novarupta eruption in this 1990 view from the SW.
Photo by Game McGimsey, 1990 (U.S. Geological Survey, Alaska Volcano Observatory). 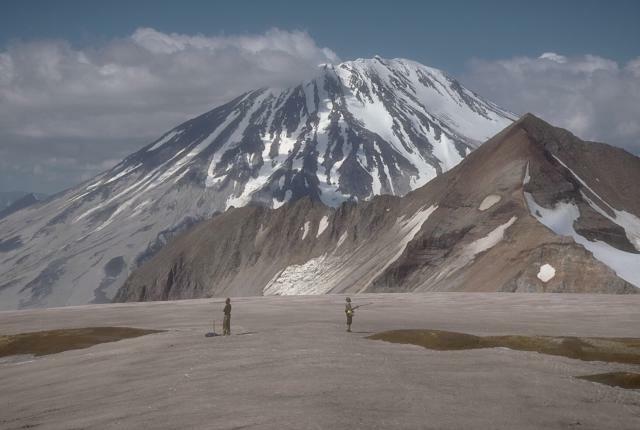 Mount Griggs, seen here from the west rim of Katmai caldera, is a 2265-m stratovolcano that lies west of a NE-trending arc of volcanoes cutting across Katmai National Park. No historical eruptions are known from this largely Holocene volcano. Noisy fumarolic jets at the summit of Griggs can be heard from long distances. Photo by Game McGimsey (Alaska Volcano Observatory, U.S. Geological Survey). 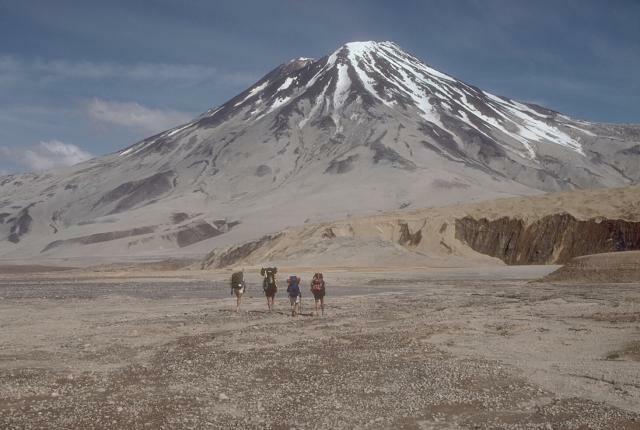 Geologists walk toward 2265-m-high Griggs volcano from the base of Knife Creek Glacier to its south. The relatively unmodified slopes of the volcano reflect its largely Holocene age. Although no historical eruptions have been reported from Griggs, vigorously active fumarolic fields persist in a summit crater and along the upper SW flank. Noisy fumarole jets can be heard from the valley floor. The slopes of Griggs and the surface of Knife Creek Glacier are heavily mantled by gray fallout from the 1912 Novarupta eruption. There are no samples for Griggs in the Smithsonian's NMNH Department of Mineral Sciences Rock and Ore collection. Large Eruptions of Griggs Information about large Quaternary eruptions (VEI >= 4) is cataloged in the Large Magnitude Explosive Volcanic Eruptions (LaMEVE) database of the Volcano Global Risk Identification and Analysis Project (VOGRIPA).